Today’s internet is bland. Everything looks the same: generic fonts, no layouts to speak of, interchangeable pages, and an absence of expressive visual language. Even micro-typography is a mess. Web design today seems to be driven by technical and ideological constraints rather than creativity and ideas. Every page consists of containers in containers in containers; sometimes text, sometimes images. Nothing is truly designed, it’s simply assumed. Ironically, today’s web technologies have enormous design capabilities. We have the capability to implement almost every conceivable idea and layout. We can create radical, surprising, and evocative websites. 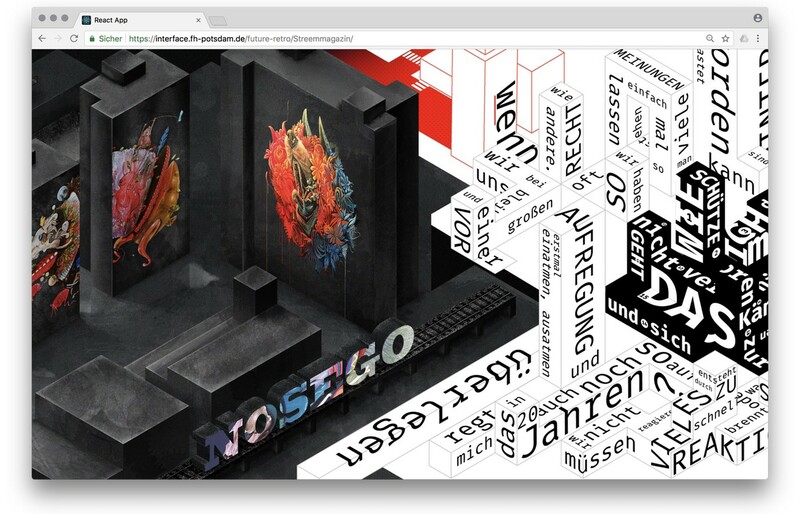 We can combine experimental typography with generative images and interactive experiences. There are a few reasons. Technological frameworks like Content Management Systems (CMS) and blogging platforms like WordPress are based on templates. Web pages on these frameworks are not individually crafted but generated on the fly by piecing together various media types like images, headlines, body text, and videos. Templates are not designs. Rather, they are rules for combining related data types. Beyond the template, these platforms typically offer users no way to influence a page’s visual appearance. What you see is what you poured into the template. In other words, templates are content agnostic. And that is the problem. One of the fundamental principles of design is a deep and meaningful connection between form and content; form should both reflect and shape content. Separating them breaks this principle and creates generic content containers. In a design sense, templates are meaningless; the form adds nothing to the content. One of the fundamental principles of design is a deep and meaningful connection between form and content. I suspect designers’ creative and intellectual laziness is to blame, too. In the age of mobile-first, generic, framework-driven development, nobody seems to bother with the visual and contextual integrity of a web page. How can we tackle this challenge? 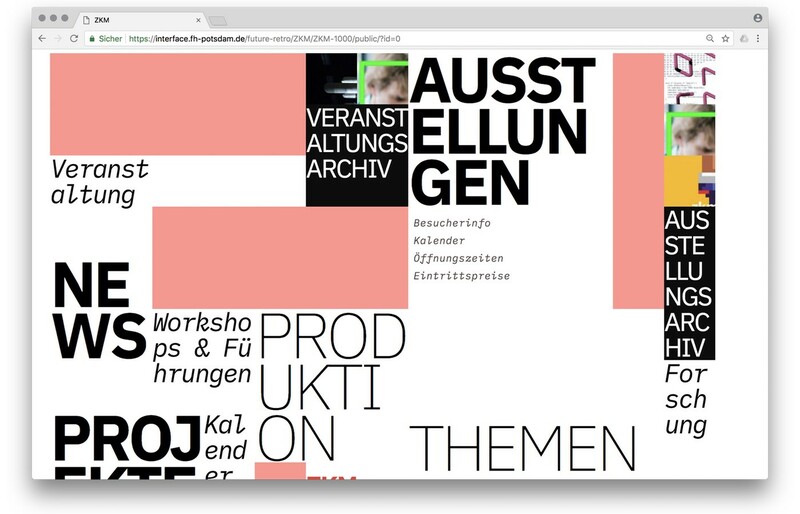 What can expressive and avant-garde websites look like today? Sometimes, if you want to design the future, you have to rediscover the past. I designed my first website about 23 years ago at the research and development group at the University of the Arts in Bremen, Germany. Creating web pages was hot at the time. The web was young. Pages sparked my imagination. In the mid-nineties, we were struggling with the constraints of HTML. We could only use web-safe fonts like Arial, Times, or Verdana. We had to use table layouts, monospaced fonts, or GIFs if we wanted to do anything exciting. HTML was purely content-driven initially, and we had to work against the technology in order to design a page. At the same time, experimental typography was exploding. From Jan Tschichold’s Die Neue Typographie in the twenties to the computer-driven layouts by April Greiman in the eighties, designers challenged the status quo and tried to find a visual language that represented the ideas and revolutions of their eras. By the mid-nineties, an unusual combination of technological and cultural advancements allowed for a very radical breed of graphic design. You could see it in the work of Irma Boom, David Carson, Paula Scher, Neville Brody, and many others. We wanted to do graphic design in the browser, but nobody knew how — or what mistakes could be made. There were no expectations of how a web page should look. There were no standards. 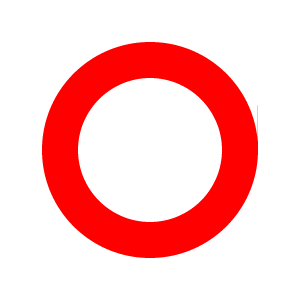 No CMS (almost), no CSS, no JS, no video, no animation. Now is as good a time as any to challenge the internet’s visual conformity. Web design’s problem is not the limits of technology but the limits of our imagination. We’ve become far too obedient to visual conformity, economic viability, and assumed expectations. However, every crisis creates an opportunity. Now is as good a time as any to challenge the internet’s visual conformity. Alas, I am too old and too bourgeois to come up with a radical, experimental, and state-of-the-art approach to web design. But I can ask my students to do it. I was very happy with the outcome of the class. (You can see all the results on this overview page.) Here are four projects that represent different approaches to the challenge. Frederic and Jonas chose the web site of the Zentrum für Kunst und Medien (ZKM) as a starting point for their experiments and explorations. A very fitting choice as the ZKM is one of the most prominent exhibition spaces for media art in Germany but ZKM’s website is fairly conventional. It’s functional but it lacks the avant-garde assertion that is conveyed by artwork in the exhibitions. Frederic and Jonas’s aim was to design a concept, a visual language, and a technical setup for the ZKM site that represents the museum’s progressive approach. At the core of their concept is a generative design engine: Every time a page loads, a new layout is created. View the redesign of the ZKM. Streem is an art and street magazine. It is both a stage for upcoming artists and a platform for social issues. Streem includes work from illustration, painting, photography, design, writing, and journalism. Daria, Bela, and Lucas combined these different influences and based their designs on a conceptual city structure. For their prototype, they created four different neighborhoods that each represent a section of the magazine. Their approach combines strong illustrative styles with spatial typography in order to create a legible city. View the redesign of Streem. Amelie and Fabian took a very structural approach. Instead of finding an adequate form for a specific story, their aim was to dissolve a web page and break it down to semantic, syntactical, and statistical properties. Their idea was to demonstrate the fluidity and inherent malleability of HTML. 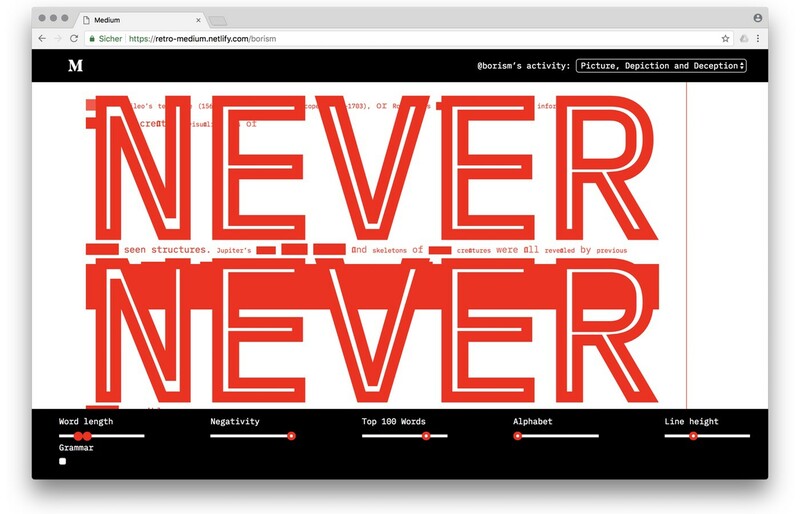 They deconstructed Medium posts and created an environment that allows readers to break long blocks of text into experimental typographic space. View the redesign of Medium. 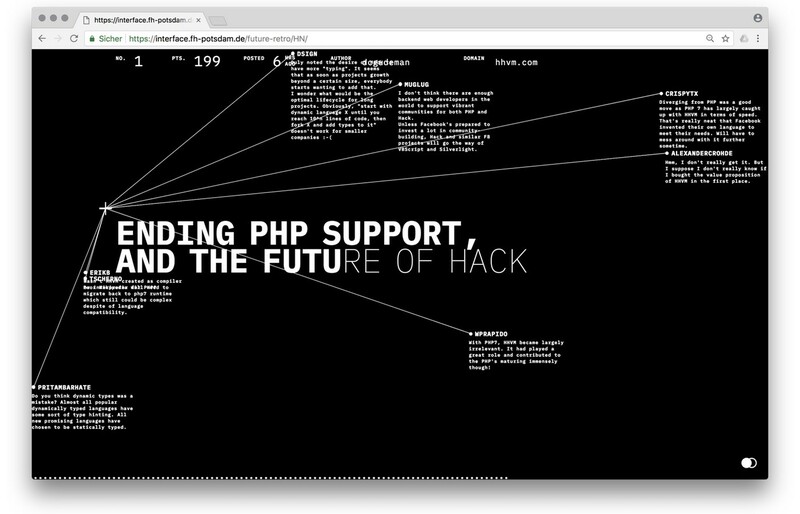 Fabian and Florian turned Hacker News into an interactive visualization. The social media site is a news aggregator, focusing on computer science and information technology. Its design is bare-bones but it has complex functionality for voting and discussions. Fabian and Florian have taken the existing structure and turned it into a typographic space of timelines and networks. The visual presentation is based on the sequence and connections of news and comments. They also connected their design to the API of Hacker News, so you can actually use it to read the site. View the redesign of Hacker News. David Carson once said, “don’t confuse communication with legibility.” We should apply this advice to the current state of web design. Legibility, usability, responsiveness, and especially accessibility are essential qualities of the modern web. But they should not define and limit its visual repertoire. If you equate stereotypes with usability, you have understood neither visual design nor human-centered design. I, for one, would like to see more radical, generative, evocative, thoughtful, adequate, content-specific, and intelligent web design. I would like to rediscover the web as a space for design experiments. I would like to be surprised more often. I don’t know what the web will look in another 23 years, but I certainly hope it doesn’t look like the web today.